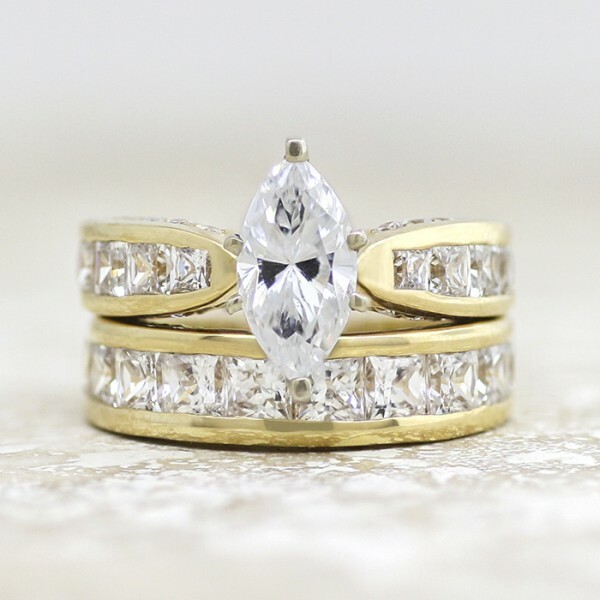 Retired Model Deco with 2.11 carat Marquise Center and One Matching Band - 14k Yellow Gold - Ring Size 7.0-10.0 was added to your cart. This showstopper brings glamour to new heights. The lofted Contemporary Nexus Diamond center stone shines high above the accented band, which is set with even more Nexus Diamonds along the top and sides of the shank. Though the band is thick, it tapers gracefully toward the center, making the main stone appear larger and even more brilliant. The substantial matching band completes this bridal set. Center Stone: 2.11 carat Marquise cut Nexus Diamond. This is an older version of our Deco engagement ring. It may not fit well with a new-style Deco matching band. The latest model can be found here.